Over the past few days, I have been watching many (over half so far) of Chris Duane's remarkable set of videos about silver. He makes a great case that ownership of silver will be the single best investment in the coming years, as our paper money dies. Way too briefly, me makes the case that out US$ is doomed, and that precious metals are the way for each of us to remain solvent. Especially silver, which is the better of the two because of its vital industrial use (it is used in more applications than any other material except oil and oil products). The Greatest Truth Never Told is (overly short and over-generalized) shows how liberty will eventually win despite how we have been enslaved throughout history... How we each can become "our highest and best self that we can be." Despite Chris Duane's strong case for holding silver (only -- All Inn! ), I remain a believer in gold being the strongest and safest investment as a store of value. Long-time readers of my blog already know my reasons (the central banks store gold, gold has already been chosen by humanity as its preferred store of wealth, etc.). And finally to finish this article, I copy FOFOA's graphic below (http://fofoa.blogspot.com/2010/09/shoeshine-boy.html), perhaps my favorite all time graphic ever! In short, the above tells us that at some point the paper gold market (gold futures, unallocated and even allocated (MF Global, folks, was allocated gold), gold being loaned out by the "bullion banks", etc.) 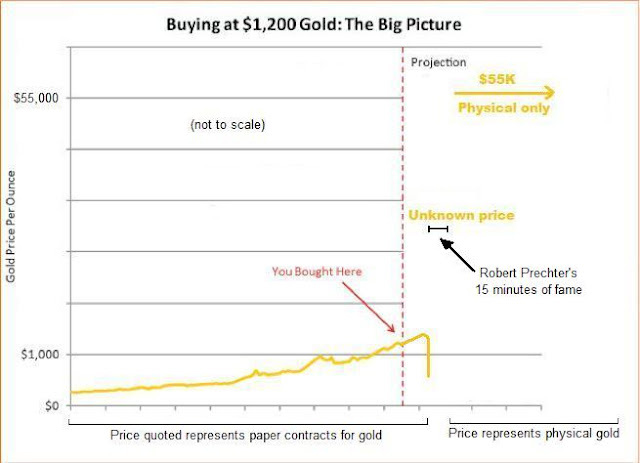 will "break", that PROMISES (paper gold) will become worth less (or even worthless) and so the price of paper gold may very well fall (to, say, $500), but you will NOT FIND any real physical gold for sale... During that short time where gold's price is unknown, you may find Robert Prechter all over the media, his "15 minutes of fame"! He wrote his piece (and published that graphic) back in 2010. Gold is no longer available at $1200, as I write (with Isaac's wind and rain outside), gold is around $1670.